Good times are comin'! 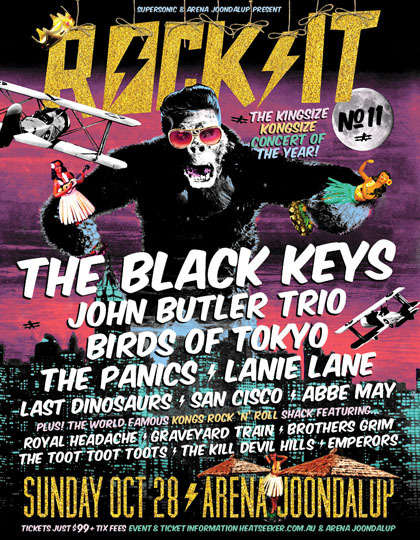 Rock-It is back and turns it up to eleven with number 11; the kingsize, kongsize concert of the year. Always reliable to only roll out the rock when someone special comes to town – Rock It was pleased as punch to follow the footsteps of Foo Fighters, Green Day, Jack Johnson, Powderfinger, Jet, Kings of Leon, Oasis, Silverchair and many more with the awesome awesomeness of our 2012 headliner The Black Keys. Just like foodies match their wine – we’ve matched the rock and blues maelstrom of The Black Keys with an excellent day of Australian (and especially plenty of West Australian) rock and roll heroes. We’ve got a combination of established hit-makers to keep you singing along and some of our most exciting emerging artists to keep you screaming and some incredible new blood that needs to be seen to be believed. For those who like to explore new music, the world’s famous Kong’s Rock and Roll Shacktakes up the slack on the Lawns of Love and presents some of the hottest, grittiest and authentic rock and roll available right now. Best of all – it is designed to be a fun day with music in WA’s best and grassiest event arena that aims at nothing but good times. Rock it is a WA owned and operated event that is an independent, great value, big production, single stage affair with a short, hot bill; old school style. No fuss - just incredible music and every effort to keep it comfortable, simple, friendly and affordable.